For some reason the link to the Extendable Makeup Mirror in yesterday’s blog quit working, even after I check it before posting it. So here it is again. We left the rig a little after noon for a trip to the Monterey’s Little Mexico up in Pasadena. We were hoping to catch up with our favorite waitress Julie, who is a flood refuge from Harvey. The Dickinson Monterey’s was flooded out and won’t reopen until March, so their staff was redistributed around to other locations in Houston. When we were at the Alvin location a few weeks ago, one of the displaced managers told us that Julie was working at the Pasadena location. But since she only works the lunch shift Monday through Friday, we’re limited to Tuesdays and Thursdays. So, after the holidays, today was our first chance. But it was all for naught. When we got there we found that Julie was out sick today. But we still had a great meal of Beef Fajita Nachos and Chicken Tortilla Soup anyway. We’ll call ahead next time. Coming home we made a Wal-Mart stop for a few things, and then it was on to the PO to buy Christmas stamps and get the first batch of cards in the mail. Then after an Ace Hardware stop for a couple of things, we made a client stop to pick up a couple of Amazon packages that should have been delivered yesterday, but according to the USPS tracking, had been sitting in the local PO since Sunday afternoon. But at least they finally showed up. Later in the evening, I followed the example of our friend Dave Evans and mounted a plug strip over the sink. I shortened the cord using a new plug I picked up at the Ace Hardware stop and got it mounted. 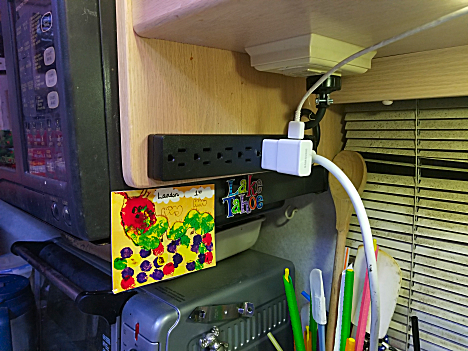 It’ll make it a lot easier to plug in all the different chargers and accessories we have. Tomorrow it’s back to work.